Periodic subsea inspections and routine maintenance are generally seen as a necessary evil by many Operators and not as an opportunity. This is because there are no regulatory requirements instructing Operators to conform to or to implement an Integrity Management Program. On a recent project, GATE performed an assessment of the subsea equipment and flowlines to provide a link between sand production and erosion risk. This link enables the Operator to evaluate production rates against the expected remaining life of the equipment, in particular the MPFMs (Multi-Phase Flow Meter), and to develop an intervention program schedule that depends on the prevailing production rates and the associated level of sand production. By assessing this risk early, threats, such as deferred production costs and well work-over costs following any serious sand control failure in a production well, are minimized. These intervention costs could have a huge impact on the life of field economics for subsea developments. When is the Best Time to Start Focusing on IMR? GATE recommends development of an IMR Philosophy during FEED, consequently completing an Installability & Maintainability (I&M) review during Detailed Design and that is continued and refined throughout the fabrication phase. All subsea facilities should be reliable, maintainable and cost-effective to operate and should retain their integrity throughout the life of the field. For this to be achieved, it is critical that those who will operate the subsea facility are able to contribute to the design and procurement. This is an example of why the Operations team should be involved early in the project phase. The Operations team can influence the design of the subsea components to simplify future inspections, maintenance and repair operations. Recommendations from the Operations team will allow the project team to make informed decisions relating to the design and arrangements of key pieces of the subsea hardware; this can be accomplished by hosting an Installability and Maintainability (I&M) review. I&M reviews are carried out to highlight the potential issues which could impact either the operational response capacity, the HSE policies, the equipment Mean Time to Repair (MTR) or the OPEX allowance for the Inspection and Maintenance works on subsea structures. 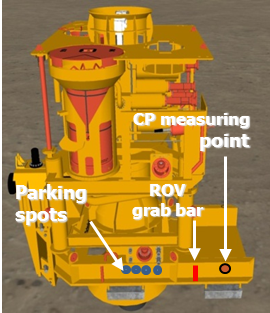 I&M reviews are also carried out to propose possible equipment design improvements to optimize subsea inspections and subsea maintenance tasks. These reviews will consist of checking design and construction aspects of the subsea equipment against the subsea inspection and module change-out interventions. I&M reviews should be performed with a IMR vision during the design of the project. This review will ideally start as soon as enough required Contractor documents for the given equipment are available. Hang-off, load transfer, auxiliary winch and heave compensation device requirements. The benefits of an I&M review during the early project phase substantially outweigh the cost which can be incurred during an unplanned or unnecessarily complex intervention operation. Such intervention costs far exceed the procurement cost of most components and so are a major target for operability assessment and optimization. The combination of an I&M review leading to the development of a detailed IMR strategy is a highly effective means of reducing the operating risk associated with complex subsea production systems and can also result in substantial operational cost and deferred production savings over the life of a field.